/EINPresswire.com/ -- SEOUL, SOUTH KOREA--(Marketwired - Nov 28, 2017) - Enjoy more live content for the 2017 Mnet Asian Music Awards (2017 MAMA), the biggest music festival in Asia on Twitter. 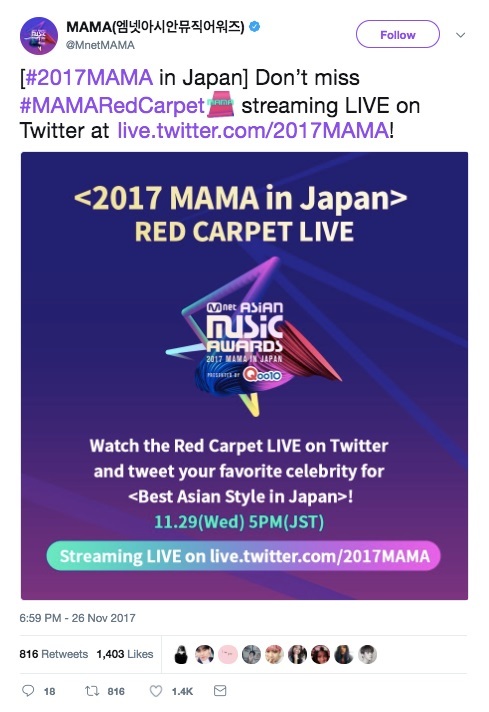 There will be exciting things to see and do provided by Twitter at the '2017 MAMA' held in Yokohama on November 29 and Hong Kong on December 1. For the first time, the '2017 MAMA' red carpet will be livestreamed on Twitter via a special live page live.twitter.com/2017MAMA and fans can exclusively vote for the Best Asian Style Awards by Tweeting with the hashtags #MAMARedCarpet and #NameOfArtist. Celebrities with the most number of Tweet votes from the red carpet in each of the two cities will be awarded the Best Asian Style prize during the main ceremony in Yokohama and in Hong Kong respectively. Kpop fans will also enjoy the first-ever #MAMARedCarpet emoji for both cities. The vote will start in Yokohama from 17:00 to 18:30 (JST) on 29 November 2017 and in Hong Kong from 17:00 to 18:30 (HKT) on 1 December 2017. Before the show begins, Twitter's 360-degree camera booth will be installed on the red carpet at both locations so that fans can watch the celebrities' appearances at the 2017 MAMA from all angles. Twitter will also prepare a special #BlueRoom located at the backstage as another first-on-Twitter for 2017 MAMA. At this zone, your favourite artistes will share their thank-you messages directly with fans on Twitter after receiving their awards. This will be broadcasted live via Periscope Producer from @MnetMAMA for fans worldwide to watch for free on Twitter. Those who could not attend the event can still enjoy the festivities at the scene by following MAMA's official Twitter account @MnetMAMA or search the official hashtag #2017MAMA on Twitter to see all of the live action. 2017 is the 9th year for MAMA, starring popular musicians such as BTS (@bts_twt), EXO (@weareoneEXO), Twice (@JYPETWICE) and Wanna One (@WannaOne_twt). Please follow the artists' accounts on Twitter to see all of their preparation for the 2017 MAMA event. Twitter is what's happening in the world and what people are talking about right now, from breaking news and entertainment to sports, politics, and everyday interests.. Join the open conversation. Watch live streaming events. Available in more than 40 languages around the world, the service can be accessed via twitter.com, an array of mobile devices, and SMS. For more information, please visit about.twitter.com, follow @Twitter, and download both the Twitter and Periscope apps at twitter.com/download and periscope.tv. MAMA (Mnet Asian Music Awards) is Asia's greatest awards show dedicated to celebrating the brightest stars in music. The 2017 MAMA (Mnet Asian Music Awards) ceremony, organized by CJ E&M through its music channel Mnet, will take place from November 25 through December 1, 2017 in Vietnam, Japan and Hong Kong with the theme, "Coexistence".